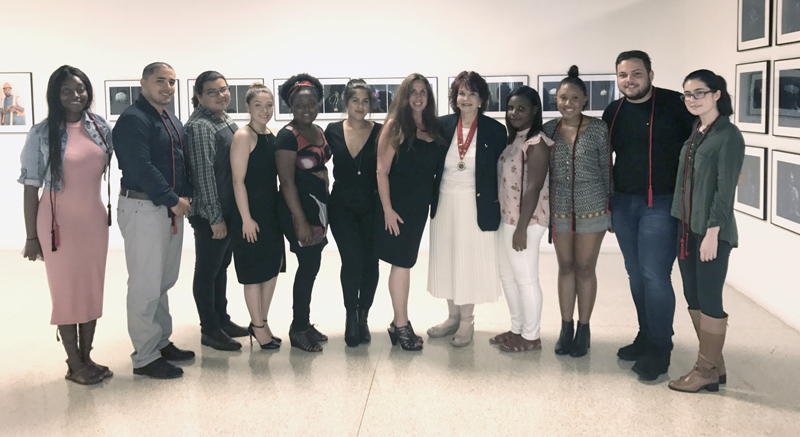 During the fall 2017 semester, co-faculty sponsors Dr. Andrea Greenbaum and Dr. Lillian Schanfield inducted seven new members into the Sigma Tau Delta International English Honor Society, Alpha Alpha Xi Chapter. Sigma Tau Delta, one of the largest members of the Association of College Honor Societies, confers distinction for high achievement in all aspects of the discipline of English and offers a myriad of professional and academic benefits to its members. Josaphat spoke about the influence the Professional Writing program had on her career, and she emphasized that the current inductees should take advantage of Sigma Tau Delta’s yearly conference. It was there, she said, that she learned how to present a paper in an academic setting and how to professionalize herself as a writer. Moreover, she emphasized that the conference allowed her to interact with noted writers, helping her to gain confidence as a professional. She concluded her presentation by reading an excerpt from Dancing in the Baron’s Shadow, telling her audience that it was Greenbaum’s Screenwriting class (ENG 446) that influenced her narrative style, envisioning her text as cinematic and using that sense of momentum in her fiction. Students who meet the criteria for Sigma Tau Delta are invited for membership during the fall semester. Sigma Tau Delta members serve as reviewers for the annual writing contest and as editors for What Oft Was Thought. Students with questions regarding induction into Sigma Tau Delta should contact Dr. Andrea Greenbaum at agreenbaum@barry.edu or Dr. Lillian Schanfield at lschanfield@barry.edu.